Looking for a reason to spread your wings and visit a new airport in North Carolina? 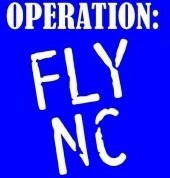 Operation: Fly NC may be just the ticket. Launched in April ‘2009 by Tom Freeman (whom many of you know from our visits to the NCDOT Division of Aviation), Operation: Fly NC is designed to encourage general aviation pilots to visit 81 public use airports in the State, tour NC aviation museums, and participate in pilot training events. Gold Level: Fly to all 81 airports in the official “Operation: Fly NC” booklet, attend four pilot safety seminars and visit four museums. Silver Level: Fly to 60 airports in the official “Operation: Fly NC” booklet, attend three pilot safety seminars and visit three museums. Bronze Level: Fly to 30 airports in the official “Operation: Fly NC” booklet, attend one safety seminar and visit one museum.